Occasionally we take a break from all the “well balanced” meals we try to eat and have one that consists of cheese, prosciutto, sausage, and red wine. So tonight we did just that! While the little guy munched on last night’s leftover red pesto pasta with some avocado and a selection of cheese, my wife and I indulged in what I consider one of my favorite meals. 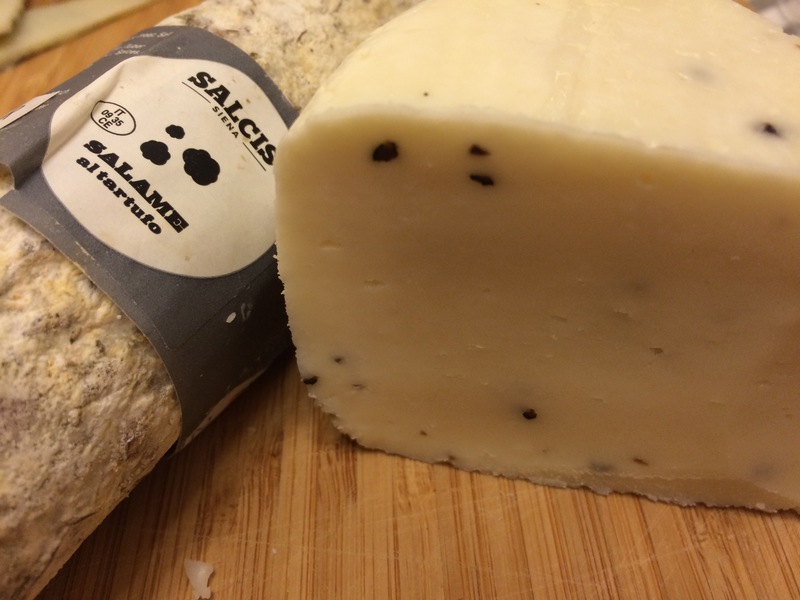 Highlighting the night was the Truffle Pecorino that I picked up at the local supermarket. Most people know Pecorino Romano, a hard, sharp cheese that looks vaguely like Parmesan. But there is also simply “Pecorino,” which is also a sheep’s milk cheese (“pecora” is “sheep” in Italian). Pecorino cheese is softer, maybe in consistency like a Gouda, and it is creamy in flavor; it is a generally overlooked cheese in my opinion. And then when you add truffle to it, oh man, it doesn’t get any better. On top of that, we bought a truffle sausage when we were in Sweden that we brought with us to Hong Kong, and we cracked that open tonight. It was also good, although a bit fattier than a typical truffle sausage. It was white truffle, not black, so you could not see the specks inside as prominently, but the flavor was there. And to top it all off was beautiful red wine: a Pacheca Douro Reserva 2011. This was a great full-bodied wine with tons of fruit notes. It went well with the cheese and sausage, but it also does well on it’s own. Anyone who likes Zinfandel but wants to change it up a bit should try this Portuguese wine. It was great! Give it a try!